Should thoroughbred racing be your passion then Racing NSW Magazine is the publication for you. Each month this quality 200-page (approx.) magazine contains a host of interesting articles dedicated to the men, women & equine heroes in the ‘Sport of Kings’. There are impressive colour features that focus on racing’s characters (jockeys, trainers, owners and horses) and appeals to an extensive readership base including interstate and international subscribers. The magazine is also a vital tool for trainers with info such as race dates, programming, colours, ‘Daily Diary’, summary charts and contact details for all NSW trainers, jockeys, farriers, riders’ agents, licensed vets, race clubs and officials. There are also extensive articles and information on the world of breeding, and regular features such as the Rising Star Series, Bart Cummings Medal and picnic & country racing columns. 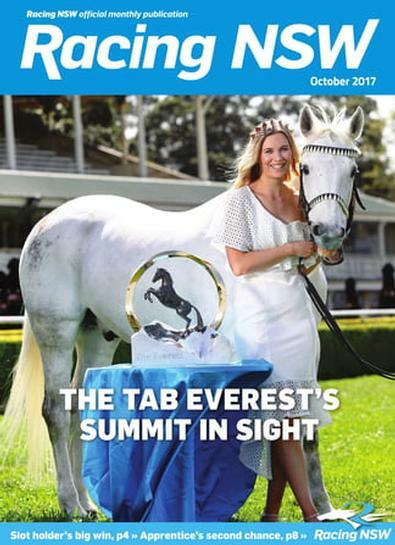 RNSW Magazine also provides excellent marketing opportunities for advertisers as it is read by the racing people who matter. What are you waiting for – SUBSCRIBE TODAY! !